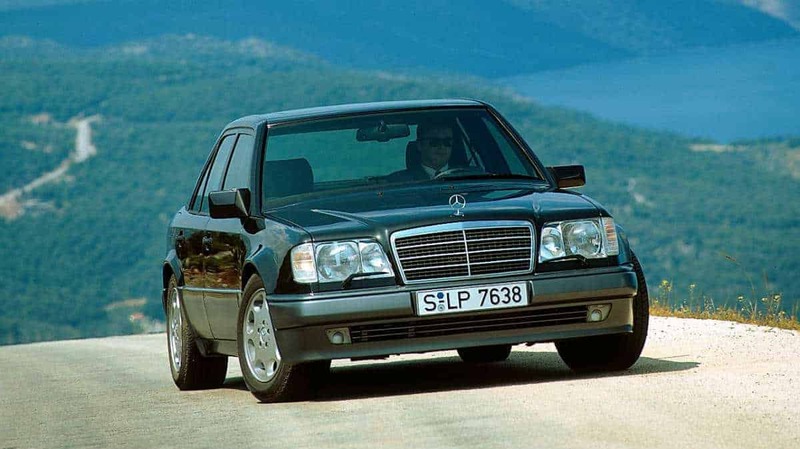 Anyone in the know will already be slavering at this model designation: launched in 1990, 25 years ago, the Mercedes-Benz 500 E with V8 engine and subtly muscular body is the top-of-the-range model in the 124 model series – and has long been one of the brand’s most desirable ‘young classic’ models. 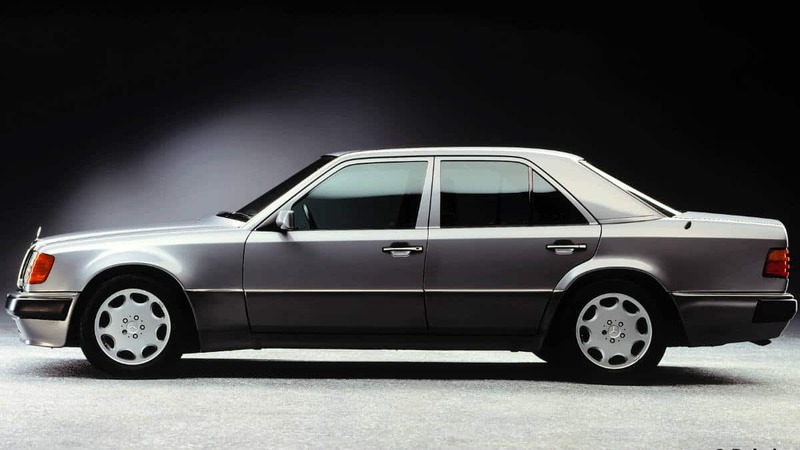 A modest appearance, at first glance – this is one side of the Mercedes-Benz 500 E. Only the somewhat more voluminous wings, the slightly lower body and a modified front apron with inset fog lamps differentiate it from the other models in the 124 series. But then there’s the engine: eight cylinders in a ‘V’ configuration, a displacement of 5 liters, 326 hp (240 kW) of power. All of which makes this saloon something of a wolf in sheep’s clothing. It takes just 6.1 seconds for the sprint from 0 to 100 km/h, while the top speed is electronically limited to 250 km/h – performance figures worthy of a sports car. 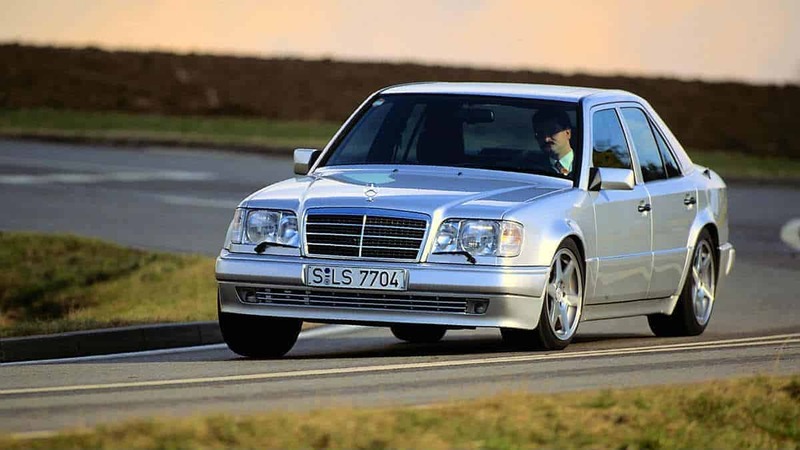 The combination of all these ingredients and characteristics creates the allure that the Mercedes-Benz 500 E has exuded since the moment of its first appearance at the Paris motor show in October 1990. You can still feel it today. Indeed, this powerful saloon has long been one of the most highly sought-after young classic cars bearing the three-pointed star. Just 10,479 units were built in the years until 1995 – a figure that also includes the E 60 AMG, with which it is counted in the production statistics. The first 500 E cost 134,520 Deutschmarks – more than twice as much as a 300 E, a car which itself could not exactly be called unspectacular. By the end the price was 145,590 Deutschmarks for an E 500, as it was designated from 1993 onwards. So it is perhaps hardly surprising that there are very few well-preserved 500 E/E 500 models still around. But anyone who does buy one, will find they have an exceptional and powerful saloon that is nevertheless extremely practical for everyday use. The engine and four-speed automatic transmission were taken from the 500 SL, but the 500 E did incorporate several other new features: it was the first car to feature what was known as the “standard deck” engine – one and the same crankcase used for both the 4.2 and the 5.0-litre unit. This meant that the 5.0-litre engine was 16.5 millimeters lower here than when it made its debut in the 500 SL (R 129) a year and a half earlier. Shorter connecting rods ensured that the bore-stroke ratio remained the same. In addition, in the E 500 the Bosch LH-Jetronic injection system, with electronic control and air-mass sensor, replaced the previously used mechanical/electronic KE system. From October 1992 the engine output was lowered slightly to 320 hp (235 kW), in order to reduce both fuel consumption and pollutant emissions. 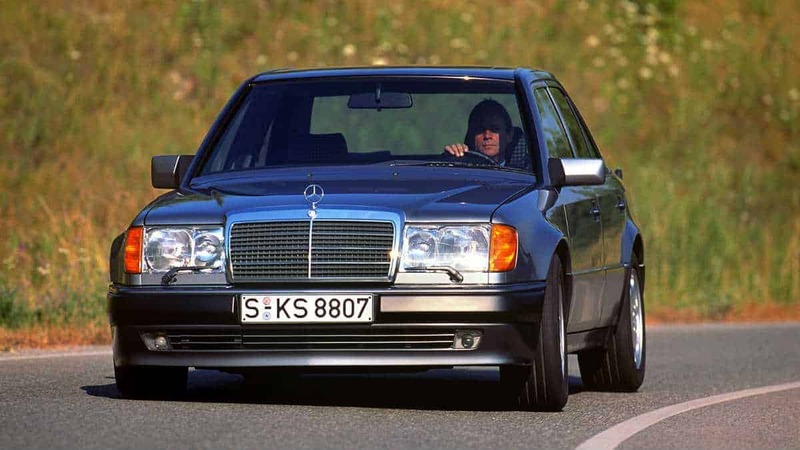 Compared with the 500 SL, the Mercedes-Benz 500 E had a shorter axle ratio (1:2.82), so benefiting acceleration. The top speed of both models was electronically limited to 250 km/h. The Mercedes-Benz 500 E, incidentally, was created in close cooperation with Porsche: also based in Stuttgart, the sports car manufacturer was brought on board by Mercedes-Benz at a very early stage in order to boost the company’s own somewhat stretched development capacity. 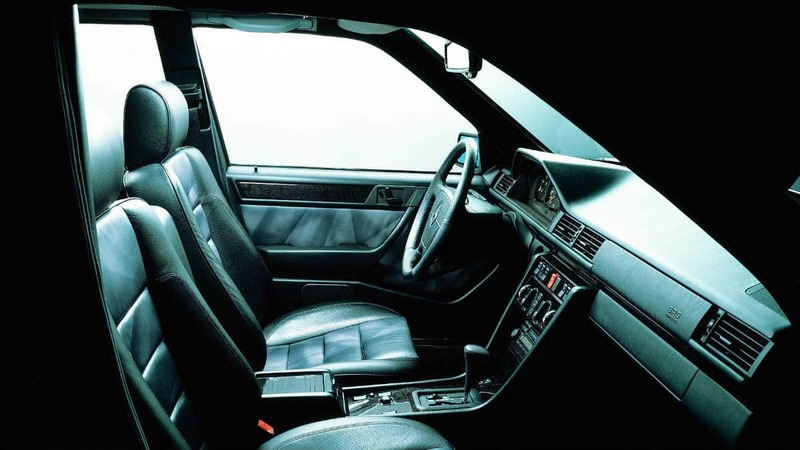 The manufacturing process was subsequently split: the bodyshell was painted at the Mercedes-Benz Sindelfingen plant, while the final assembly of the components supplied from Sindelfingen and Untertürkheim was undertaken by Porsche in Stuttgart-Zuffenhausen. There were two reasons for this. First of all, the production order came as a timely stroke of good fortune during what was a somewhat difficult period for the sports car manufacturer in the early 1990s. And secondly, the relatively small volume was an ideal match for the manufacturing processes at Porsche, meaning that production of the 500 E could not have been in better hands. 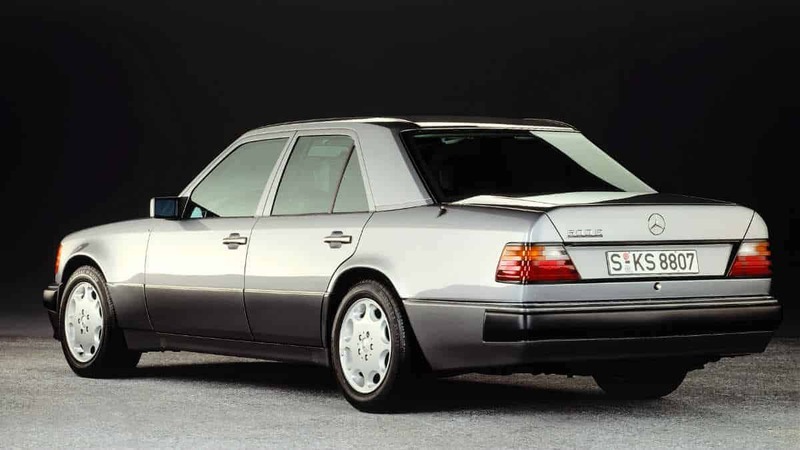 The powerful saloon benefited from the last facelift of the W 124 model series in 1993. The first change related to the name: the mid-series was renamed E-Class and, as with the other model series, the model designation now preceded the figures and the “E” for injection engine (“Einspritzer” in German) was omitted, making the 500 E the E 500. The design idiom of the exterior design was updated – with one of its revised features being the radiator grille, which from that point on was framed by and integrated into the bonnet. In the case of the saloon models, there was also a redesign of the rear end. The boot lid and the wings were given edges with a wider radius, while the area around the number plate was also modified. The equipment and appointments of the 500 E/E 500 lived up to its positioning as the top-of-the-range model in this series in that they were extremely extensive. In view of the car‘s extraordinary power, standard equipment such as acceleration skid control (ASR) was a necessity rather than mere technical gimmickry. 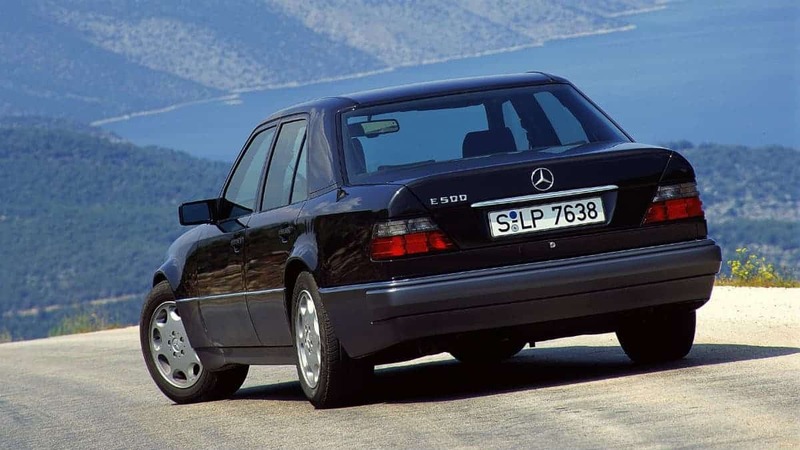 We should at this point also mention the 400 E/E 420, launched two years after the 500 E in October 1992. This car, too, had a powerful eight-cylinder engine under its 124-series body. This model may not have been designed as a sports saloon but instead as a car for effortless long-distance motoring, but when it came to inconspicuously packaged power it outrivalled the Mercedes-Benz 500 E, since it did not even feature the discreetly flared wheel arches of the sports saloon. Production of the Mercedes-Benz 500 E was discontinued in April 1995. The 210 model series was already waiting in the wings to succeed the 124 series and was launched in June 1995. There were quite a few customers who regretted not having bought an E 500. Demand for a sports saloon of this kind remains to this day, so a particularly powerful model has been part and parcel of virtually all Mercedes-Benz model series ever since – often created in collaboration with cooperation partner AMG, which became the subsidiary company Mercedes-AMG GmbH in early 1999. 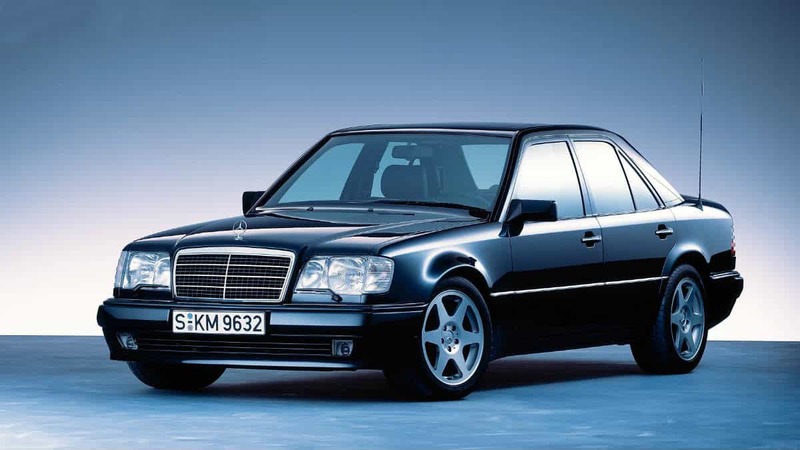 The International Motor Show in Frankfurt (IAA) in September 1995 thus marked the debut of the E 50 AMG as the successor to the 500 E.